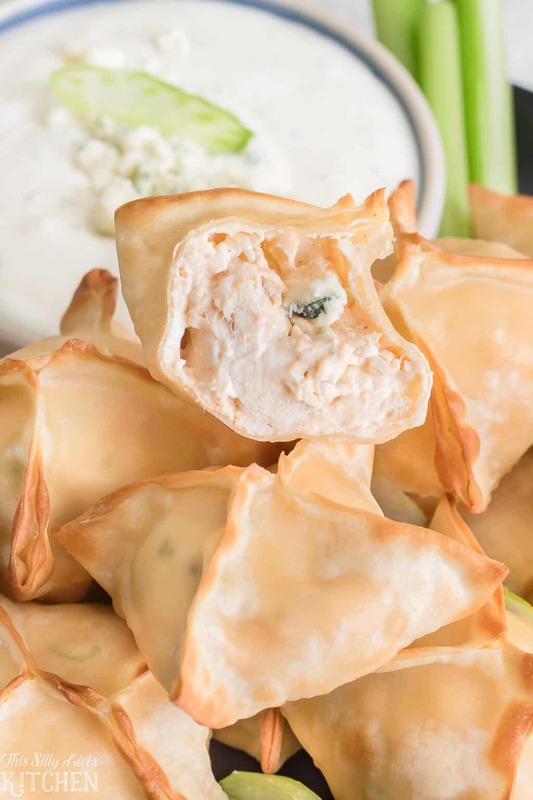 Buffalo Chicken Wontons, only 6 ingredients and ready in 15 minutes, perfect for game day! 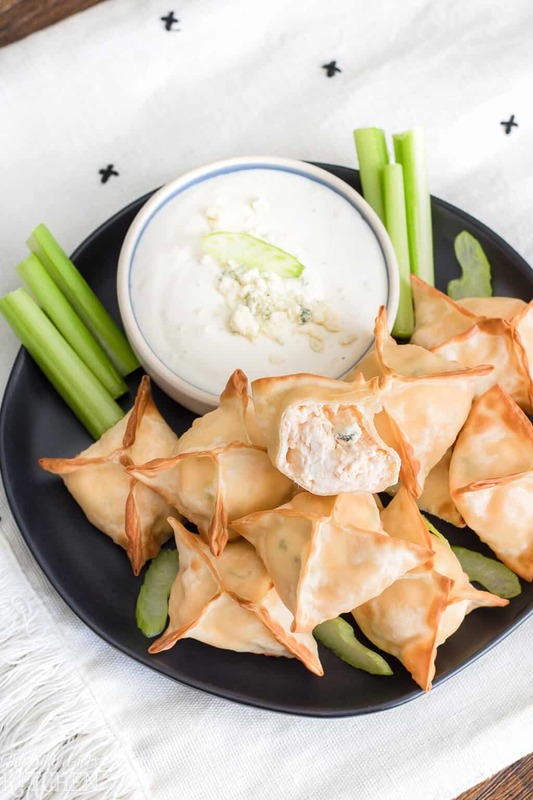 Buffalo Chicken Wontons made in the AirFryer are going to be a HUGE hit on your game day spread!! 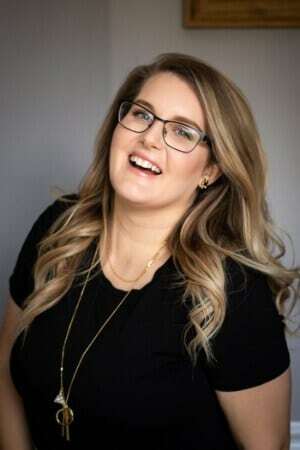 This post was sponsored by Philips Kitchen Appliances as part of an Influencer Activation for Influence Central and all opinions expressed in my post are my own. 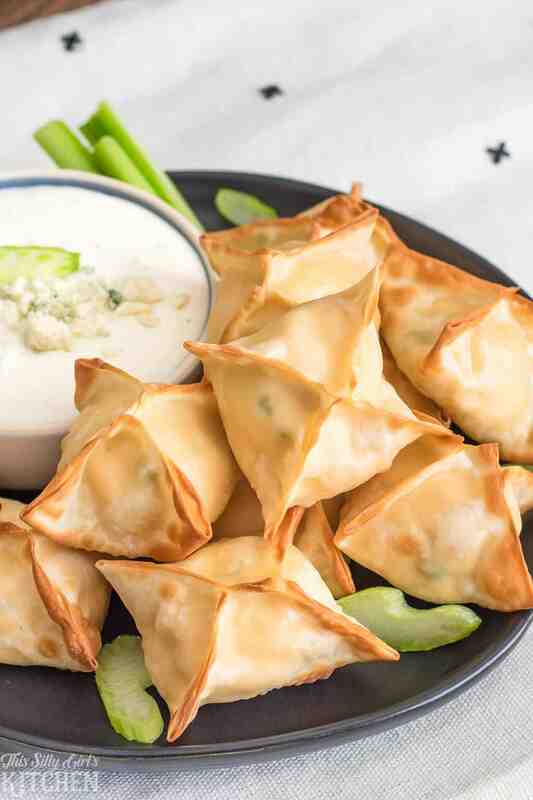 Not only are these cream cheese wontons addictive, they are SO super simple to make with just 6 ingredients. Plus, there is virtually no cleanup thanks to the Viva AirFryer from Philips! 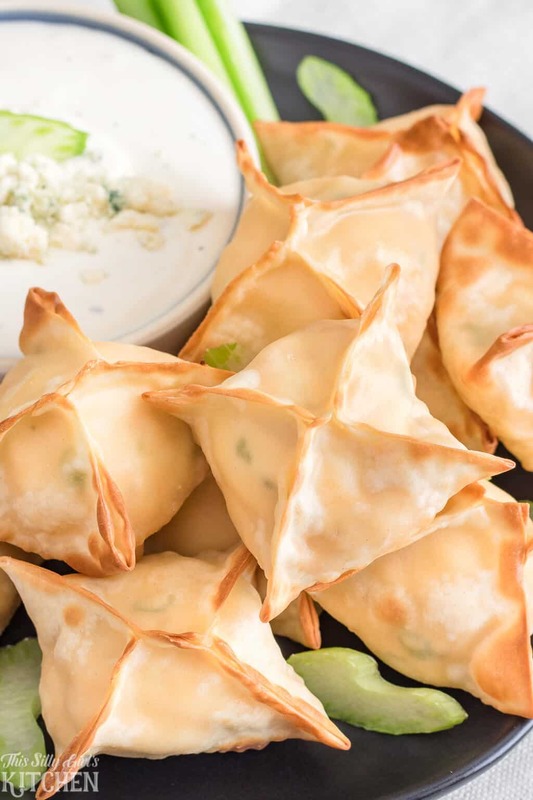 This airfyer wonton recipe comes together in just 15 minutes and is super easy to also prepare ahead of time, making game day a breeze! All you need are wonton wrappers, shredded chicken, cream cheese, blue cheese, scallions, and buffalo sauce, that’s it! They are crispy on the outside and creamy on the inside. I served them up with a side of blue cheese dressing and celery sticks, which are both totally optional. Honestly, these are so good that while making this recipe I couldn’t stop “sampling” them! They would make a great snack or even a dinner any day of the week. I picked up a rotisserie chicken to make these even easier, but feel free to use whatever chicken you’d like. With over 7 million units sold, the Philips AirFryer is the world’s #1 Airfyer. You can make healthier versions of your favorite foods by frying with a tablespoon or less of oil. You don’t need any additional accessories for this recipe. All you need is the basket! Preheat AirFryer by placing the dial on 400 degrees. Run for three minutes. Keep basket closed. 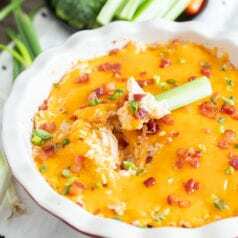 Mix together softened cream cheese, shredded chicken, scallions, blue cheese, and buffalo sauce until combined. Run a finger dipped in water along the edges of wontons. Place about 1 tablespoon of filling in each wonton wrapper. 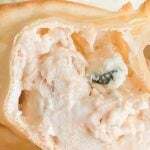 Close by bringing all four points together on top of the filling. Pinch the seams together. Place in AirFryer basket, cook for 3-5 minutes until golden brown. Serve with blue cheese dressing, optional. Words cannot describe how good these are. If you are a fan of buffalo – anything… these are for you! This recipe makes about 12 wontons. It can easily be doubled, quadrupled or even more! Also, the filling would be an ah-mazing dip! Mix together everything for the filling, plus a cup of sour cream. 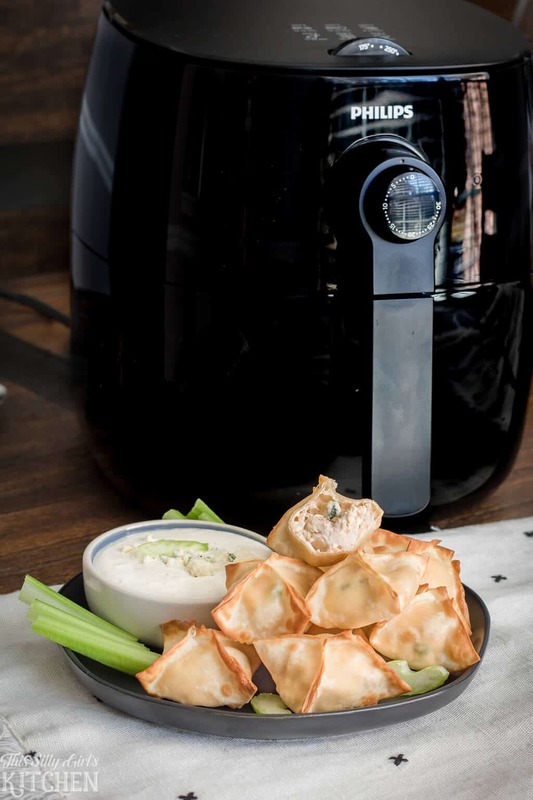 Using AirFryer wonton strips for dippers! Can I make ahead this recipe for my party? You sure can! Make up the wontons and seal them. Place them in the fridge until ready to fry. 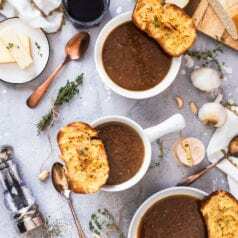 Preheat AirFryer and cook per directions – so easy! 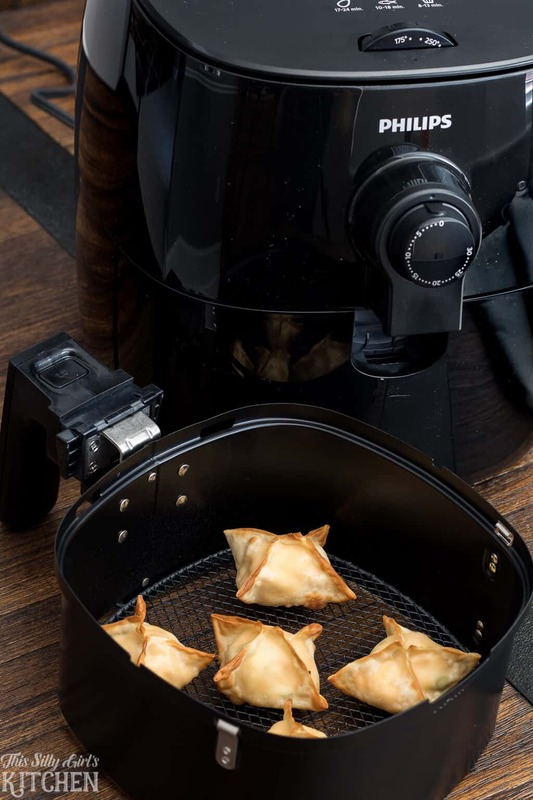 For more information about the Viva AirFryer from Philips click here! Please visit Philips Pinterest Board and “like” your favorite recipes! Preheat AirFryer by placing it on 400 degrees. Run unit for 3 minutes. In a small bowl, toss the chicken with the buffalo sauce, set aside. In a medium-sized bowl, cream the cream cheese until smooth, you can do this with a fork or hand mixer. Mix in the scallion, blue cheese, and seasoned chicken. Mix to combine. Dip a finger in a small amount of water, run finger along the edges. Place about 1 tablespoon of filling in the center of the wonton. Bring the corners of the wontons together on top of the filling, pinch the seams together. Spray the basket of the AirFryer with cooking spray. Spray the bottom of the wontons with cooking spray. 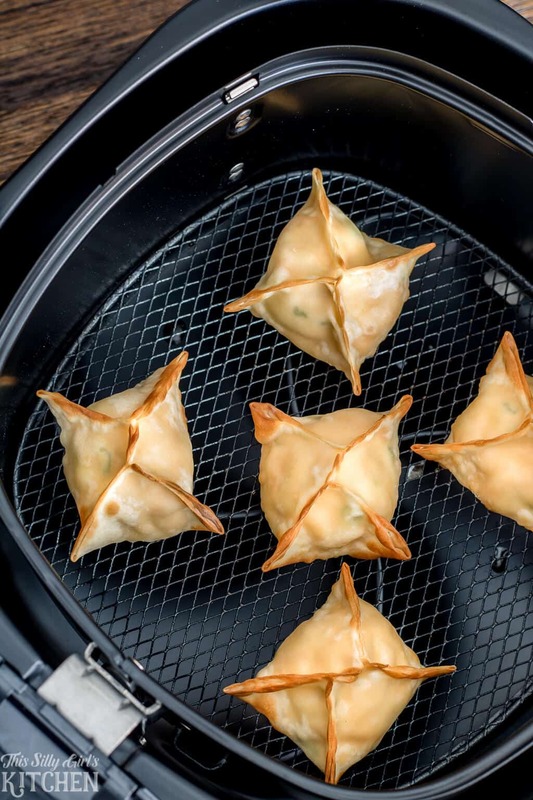 Place wontons, not touching in the AirFryer, you will need to do this in batches. Cook at 400 degrees for 3-5 minutes until golden brown. Serve with blue cheese and celery sticks, optional. What an awesome appetizer! I love anything buffalo chicken, these would be so up my alley! I’ve been hearing so much about air fryers lately. 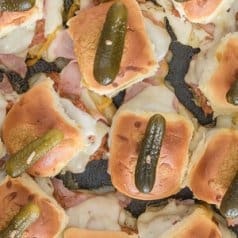 This recipe makes me feel like I just really need to get one! These wontons look awesome!